SF: Tell us how the members of Calan met and a little about the history of the band. 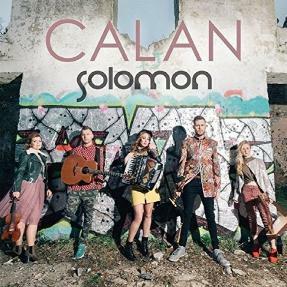 Calan: The idea of forming Calan was conceived way back in 2003 following a trip to Falun in Sweden, where Bethan and Angharad and our original harpist Llinos Eleri Jones met on the youth folk course Ethno. The three of us became good friends and stayed in touch. The following year we met Patrick and Chris ab Alun (our original guitarist) at a small festival in Dinas Mawddwy, called Cân ar Dân. We formed the band soon after that, but it wasn't until 2009 that our first album, Bling, came out. In the early days, we were all spread out between north and south Wales, and Angharad was at Oxford Brookes university. We could only get together for rehearsals once a month. A friend of ours, musician and member of the band Crasdant, Andy Mac had a house in Sling, Bethesda (near Bangor) which we'd take over for the weekend. At these rehearsals, other musician friends like Stephen Rees and Robin Huw Bowen would come over, and give us some guidance. It took some time before we were ready to perform in public. Busking on the streets of Cardiff doubled up as live practice, and the money we made would help towards our university fees. We've had a couple of line-up changes over the years, but we are now settled with Sam Humphreys on guitar (who's been with us for about five years) and Alice French on harp who joined us in 2015. SF: Kan, the opening track of your new album, Solomon, you describe as a 'patriotic song about the future of the Welsh language and culture'. Explain a little more about it as it's an interesting track? Calan: The sound of this piece has taken inspiration from anu Pwnc – a form of chanting psalms that they used to do in chapels in Pembrokeshire. We heard a recording of Canu Pwnc online collected by the song collector and historian Roy Saer, and we were so taken by the raw, hypnotic sound that we thought we'd like to emulate it in one of our pieces. By adding hip-hop beats through Sam's guitar percussion, I think we've hit on quite a unique sound, which people won't expect to hear. As for the subject, yes it's a patriotic song, but it takes a look at us as Welsh people, and questions if we've really done enough to preserve our language and culture. We have centuries of history on our shoulders, and patriotism can manifest itself in a whole load of complex feelings; feelings of burden, guilt, and pride, which I'm not sure if people from non-minority cultures feel and understand. I could be wrong though! SF: When a band member brings a new song or tune to the band, what processes do you use to decide if it eventually gets onto an album? Calan: It's usually a very collaborative approach. Someone will bring a tune or a song to the group, and we will arrange it together. We usually work towards an album, and book time in the studio at Sain, near Caernarfon. That's usually our deadline to get everything done. In an ideal world, we'd love to gig the material before recording it, but it never seems to work out that way! A new piece of music is like a new pair of shoes. You need to play the piece in before you start feeling comfortable with it. But it very rarely works like that with us! That's why I think we are still best when we are performing live. SF: You have toured America – are there particular cities or venues that are receptive to Welsh traditional music? Calan: We tour mostly along the east coast of America, where there's a very strong Celtic music following. Despite being a Welsh band we get booked for a lot of Irish and Scottish festivals, such as the Milwaukee Irish Festival or the Celtic Classics Highland Games Festival in Bethlehem, Pennsylvania. We've also played at the North American Festival of Wales, which was quite an experience. Hundreds of people gather to celebrate all things Welsh, many of whom are Welsh speakers. They hold an Eisteddfod at this festival, Gymanfa Ganu (hymn singing services) as well as performances, lectures and demonstrations. Outside of the festivals we play a mixture of theatres, village halls and folk clubs, and at almost at every gig there are people who come up to us with Welsh ancestry. SF: What does the next year hold in store for Calan? Calan: We already have two tours of North America booked in for 2018. It's also Year of Wales at the Lorient Interceltic Festival in Brittany so we will be heading out there again. But I guess we should also start looking at writing and arranging new material for a new album, and keep the ball rolling!